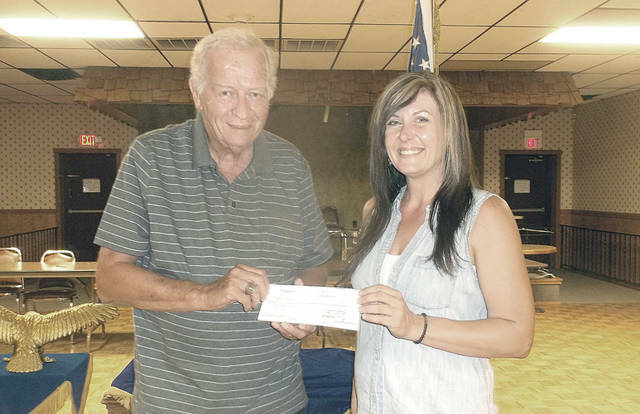 Erica Price, Greenville Eagles 2177 treasurer, presents a second donation check this year to Bob Robinson, program coordinator for Empowering Darke County Youth. GREENVILLE – Greenville Fraternal Order of Eagles 2177 presented a donation check to Empowering Darke County Youth recently. Noting the importance of supporting today’s youth, this was the organization’s second donation this year. Community support donations come from Eagles Charitable Bingo funds. The fraternal organization has a long history of actively supporting young people, from college scholarships for graduating seniors to the Empowering tutoring programs. Membership in the Eagles is open to the public. Applications can be obtained at 113 E. Third St. The organization also provides a variety of services and events to the public, including daily breakfast and lunch. Empowering Darke County Youth is a United Way Partner Agency providing after school and summer Tutoring programs to assist students in the areas of language arts and math with the goal of strong students for a strong community.